I've spent literally 100 hours looking for someone, to no avail, I now believe she is in fact, two people. That is helpful, but it means there are now two people that I cannot find. I've tried searching all the usual places, and I'm exhausted and so frustrated with it that I'm asking for help from someone who is more expert at manipulating the archives. Woman 1. born around 1860s. Maiden name Marcinkowska. Married Konstanty Wojtczak, had son Marian Konstanty Wojtczak in 1885. I got all this information on her from her son's death record. Woman 2. born around 1880s. Appears on Leonard Marcinkowski's 1929 marriage record as "Bronislawa Wojtczak". Presumably she was born Wojtczak and married Franciszek Marcinkowski (Leonard's father). Leonard was born in 1904. I cannot find any birth, marriage or death records for either Bronislawa Wojtczak or Bronislawa Marcinkowski, nor any of their children, nor their husbands. Woman 1 mentioned in son's death. Woman 2 mentioned in son's marriage. Woman 1 and 2 conflated into one person in my late father's dodgy memory! He claims to have visited her in Stary Zamosc in 1940, where she was a farmer. He gave me a photo of her and on the back he has written "Babka Marcinkowska z Bogumila" (assume Bogumily is the village she came from). He claims that she is his grandmother (via his father, Marian Konstanty Wojtczak) and he claims that she was Leonard Marcinkowski's mother, but that is impossible according to the records. Franciszek Marcinkowski reported the death of Marian Konstanty Wojtczak's son, which again proves a link. If anyone is prepared to lend a hand with this I would be very grateful. Translation of record attached; DEATH OF MARIAN WOJTCZAK It happened in Lublin on 4th December 1942 (in the presence of Wanda Konieczna, the wife of a fitter of Helenow and Bronislawa Wojtczak, nurse of Lublin, (and ?) the day before (?) at 2 o clock died in Helenow Marian Konstanty Wojtczak master brickmaker, widower of Marianna Naj, aged 57, born of Konstanty and Bronislawa Marcinkowska, married name Wojtczak, born in Elizówka, Dyś Parish, residing in Helenów, the local parish. After learning (przekonaniu się = convincing) of the death of Marian Konstanty Wojtczak, this act was signed, after reading to the gathered people. U.S.C. - Urząd Stanu Cywilnego; Civil Registry (and some signatures): Fr. ..., Wanda Konieczna, Bronisława Wojtczak. You have two families (Marcinowski and Wojtczak) who are close friends. Their children marry one another, which was a common practice over multiple generations. Each family has a daughter named Bronislawa - a common given name. The Bronislawa in the Marcinowski family ends up marrying Konstanty Wojtczak and they give birth to a son, Marian. Marian lives and dies in Helenow, Lublin. The Bronislawa in the Wojtzcak family marries Frank Marcinowski and gives birth to a son named Leonard. Leonard marries in Lublin. As to locating records for the two Bronislawas, I don't know what villages you have tried searching to locate them. Do you have the translation of Leonard's marriage record? Although the marriage seems to have been performed in Lublin, it also seems to indicate Leonard was born in a parish near Rypin. At this point, if I were you, I would assume 2 separate women, and begin trying to narrow down which one is associated with which village. 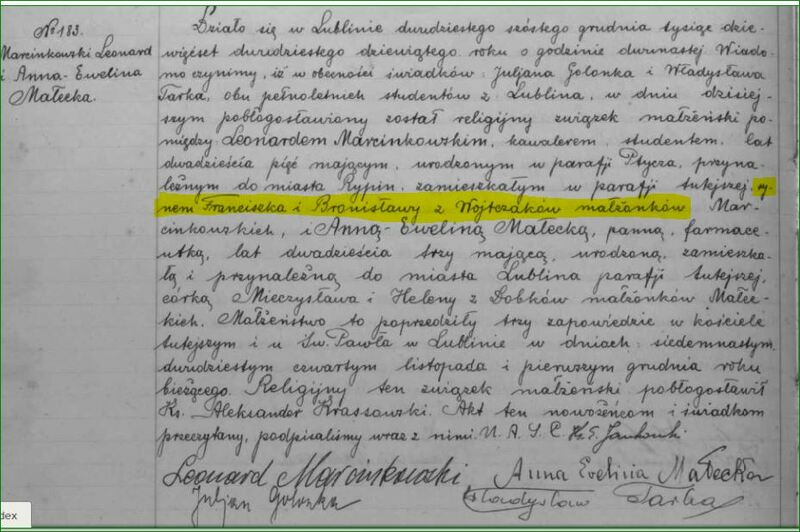 Example: in marriage record, I see Lublin and Rypin mentioned; in the death record, I see Elizowka Lublin, and Helenow. Then, your father mentions Bogumily and Stary Zamosc. Have you searched for Marian Wojtczak's birth record in Elizowki? Have you searched for Leonard Marcinowski's birth record in the village in/near Rypin as stated in his marriage record? I guess that is where I would start and work my way backwards. Hello Cynthia and thank you for taking an interest in my problem. Your assessment of the two ladies seems to match mine. Do you have the translation of Leonard's marriage record? I can understand it (I think!) but I can send it to Elzbieta, I suppose. She might turn up something I didn't understand. Elizowka is not yet scanned or indexed. His marriage says he was born in parish Ptycza - that is in Wolyn, today in Ukraine. Do we have Ukraine records on here? PS, I hope this link works. If not, let me know. Another note on the link I provided above: Two sets of scans will show up. One of them is Gmina Turobin. The other seems to be the parish of Dys. If I recall correctly, the death record indicated Elizowka Dys. Also, per google maps, Elizowka in Gmina Niemce is very close to Dys. I'm sure my dziadek was born in Elizowka Dys Niemce. This is the translation of his death record. I think if it was the other Dys it would say Turobin or Zamosc to distinguish it from the nearby one in Niemce. It happened in Lublin on 4th December 1942 (in the presence of Wanda Konieczna, the wife of a fitter of Helenow and Bronislawa Wojtczak, nurse of Lublin, (and ?) the day before (?) at 2 o clock died in Helenow Marian Konstanty Wojtczak master brickmaker, widower of Marianna Naj, aged 57, born of Konstanty and Bronislawa Marcinkowska, married name Wojtczak, born in Elizówka, Dyś Parish, residing in Helenów, the local parish. After learning (przekonaniu się = convincing) of the death of Marian Konstanty Wojtczak, this act was signed, after reading to the gathered people. U.S.C. - Urząd Stanu Cywilnego; Civil Registry (and some signatures): Fr. ..., Wanda Konieczna, Bronisława Wojtczak. I followed that link and there are zero scans for 1885. I'm going to Lublin in a couple of weeks and if I can find out where to go and where it is and how to email them to make an appointment, I could spend half a day in the archives and look for him. Of course the trouble is, I don't read Russian. Hmmm. maybe I will forget that idea. I'd still like to find our about Miss Marcinkowska and Miss Wojtczak, if I can. Found my grandfather's birth record 1884. Mother Bronislawa Wojtczak, unmarried. That ends the theory of two Bronislawas marrying friends' families. Seems Leonard Marcinkowski was her third son by Frank Marcinkowski. The others were born 1886, 1888. So she must have married Marcinkowski around 1885 but I find no record. I still need help as I am at a dead end. And I am still stuck at the same place.